If you want to maintain that fresh, natural scent for weeks after drying your clothes, use Downy fabric softener. Downy, a P&G brand, entered the United States market in 1960. Its entry was shortly followed by growth and distribution across various parts of the country. The brand is currently popular in countries such as Malaysia, Philippines, Singapore, Indonesia, Vietnam, Thailand, Latin America and Egypt. Another fabric softener brand name produced by P&G is Lenor. Lenor products are marketed in Russia, Japan, China and Europe. Plans to change the Lenor brand name to Downy in the United Kingdom were halted in 2002. 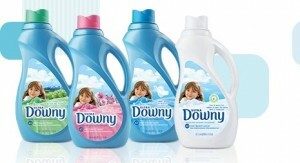 Downy strives towards helping customers feel good about the chore of cleaning clothes. Downey makes clothes feel very soft and fluffy. By providing fabric softener scents that are pleasing, the company hopes to evoke pleasant experiences and memories. The brand has provided fabric softeners for more than fifty years. These products are well known for awakening senses and making clients feel good both on the inside and on the outside. One of the mottos that Downy has lived up to is, “Get more. Feel more”. Downy has a product line comprising of Downy dryer sheets, Downy Simple Pleasures, Ultra Downy liquid, Downy ball and Downy wrinkle releaser. The brand entered Mexico in 1990 and some of the lines associated with it include Downy Tango, Downy Libre Enjuague, Downy Elegance, Downy Naturals, Downy Floral, Aerial con un toque de Downy, and Downy Pureza Silvestre. Lenor brand, which is sold in Ireland and United Kingdom, comes in a wide range of fragrances and colors. Some of the lines linked to Lenor include Lenor in the Pink, Lenor Summer Breeze, Lenor Spring Awakening, Lenor with Febreze effect, Lenor sleep sensations and Lenor crushed silk and jasmine.